A few postings ago I added some photos of a fuselage interior and asked the sharp eyed readers amongst you to guess which aircraft it is. 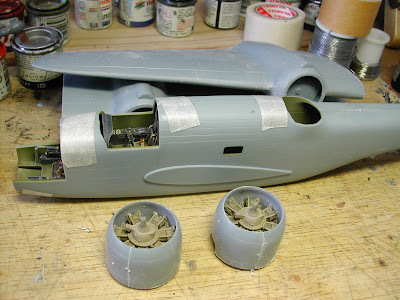 No-one is for saying, so here's a couple more shots - some more fuselage pictures and engine cowlings. I've chosen these particular photos because they show the problem areas I've been dealing with. Getting the engines into their cowlings (beautiful engines by the way) and the cockpit into the fuselage was a non starter. I did not want to touch the engines, so thinning down the cowlings was the only option. With the cockpit, floors and bulkheads all had to be reduced in order to close the fuselage. To make matters more difficult, each fuselage half was a different thickness. This meant that blending the openings for the cockpit, turret and so on had to be carefully accomplished to eliminate the large step created by the mismatch. Next up, a full rub down of all the parts and attaching all the flying surfaces. Haven't spoken in a while! Long shot here: Azur Martin Baltimore Mk V ? Hi Graham, it's good to hear from you. Right aircraft - the Baltimore - but the Classic Airframes, not Azur.